Tire will not stay beaded in the rim at 120PSI. This happen on both tires I purchased. I wanted to wait until I rode about 275 miles and needless to say not very happy in the end. First off they arrived in a timely manner but instead of a true white , it came in pearl white ... I didn't want to send them back because I had no other tire to use. In the beginning both tires looked great on my Masi and rode really well but after one season of light riding the tires ripped on me and I had to buy new ones , If you want something to last the full recommended 700 miles of a tire I wouldn't recommend these. Not happy at all with the product. Thanks for your review! I'm sorry you were less than satisfied with these tires. Please don't hesitate to get in touch with our customer service department at [email protected] in the future if you're ever unhappy with a product you've purchased from us. We try to take photos that accurately represent the colors of our products, but not every computer monitor displays color the same way. Great long lasting fast training tires. Excellent flat protection. Have gotten multiple sets and would highly recommend them. Durable winter tires. Couple with thorn resistant tubes or slime tubes they are virtually indestructible. These tires work well for me. I usually ride the tires for about 2500-3000 miles before retiring them to my old backup bike where I continue to get use out of them. Good value. As an update to my September review, let me just say that these tires appear to be bombproof. All year long with my urban commute I have tended to get flats every few weeks, but so far I have not had a single flat with these, and I've even had to weave through glass that I figured there'd be no way I'd miss. (I hope I haven't jinxed myself.) They are a touch slower than my old tires, but they seem to grip better so it's worth it for the dark, wet, winter commute. i ride hard in the city with glass and potholes until i reach contry roads and i rarely get a flat. i have climbed mountains and desended with no issues. a great tire. Good tire for the price! I got these to replace my racers with once the weather starts to get worse with the winter. As such, I haven't tried them yet, but they look as good as the pics and reviews I read led me to believe. If possible, I'll do an update once there are some miles on them. Good value! A little heavy for racing, but hey-these are training tires. Knock-knock-knock. That was me, knuckles on wood. I needed to to that before saying this I commute about 150-200 miles per week, right through a minefield of thorns, glass, and various other entities hostile to road tires where I live (Central California)...without a single flat since I started using them in early August. Seem to be wearing well, too. Durable, good handling, resistant to punctures, reasonably priced, come in colors...get 'em. Good flat protection, smooth ride. 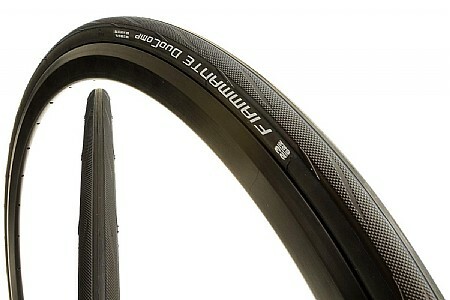 These are great tires to ride on which makes them good for training. However, be careful about the pressure you put in them because the bead tends to come off the rim just a little bit with a high pressure and makes them prone to blow outs. I wanted to ride on them for a while before I reviewed them and considering the mileage I have put on them already they have done well. Second ride I went on I ran over a huge piece of plastic on the road and pushed the tire all the way into the spoke. It punctured the tire but it has held up since then. Fast, durable, and good price. Tires look great and I have had no problems. I have them on my bike and my wife's. I would by them again. I bought this tire because I wanted the red stripe for my red road bike. I not only achieved my objective, but found the tires road more comfortable, obsorbing a lot of the minor road imperfections I normally encounter. However, the concern I have is that I may be trading off comfort for slightly increased friction. I have been cycling about 5 years and have tried many tires , mostly high end , but with this current slow economy i decided to try a less expensive tire. I live in a metro area and there is a lot of glass, etc. on the roads.I have had less flats and longer life out of these tires and they are easy to mount and are very similar to more expensive tires . I am very pleased and will most likely to continue to use these tires. i use this tire to climb mountains. it holds the extra tire pressure i need since i am 200lb. it corners very well and handles the pot holes on the descent.i am thinking about using it on my flatland bike since it is working so well. there is nothing at this time that i can say negative about the tire. I use this tire as an everyday trainer on my Cervelo RS with a SRAM Force build and it provides me with a very stable and confident ride. I am 235 lbs. and I have riden this tire on multiple occasions at 40 plus miles down a descent and it has never felt unstable. The caveat is that I have about 175 miles on the tire as of right now. Tire corners aggressively and is a very stable on most all surfaces I have ridden it on. I got a flat the first week I rode the tire but I chalk it up to a road hazard that would have flattened any tire. These are a steal for the price. I average 30-50 miles per ride and these have never let me down. I inflate these to 140 Psi and they fly! I've hit glass and ridden over cracked, rough roads and these have not let me down. I have a redwhite Madone and I got a white one for the back and a red one for the front and I always get complimented on my rides on how my bike looks. These will not disappoint you if your are an enthusiast, group rider, or even a casual rider.